Among other items, the Public Ethics Commission will be continuing its discussion of updates to the lobbyist registration ordinance. For background, you should read the account by Max Allstadt of the initial hearing and the more recent post by John Klein about the proposed changes to the ordinance. The meeting will be held at 6:30pm in Hearing Room 1, City Hall, 1 Frank Ogawa Plaza. You can read the meeting agenda here. Monday, January 4th – Assemblymember Nancy Skinner: The Legislation That Doesn’t Make the Headlines – But Impacts Our Lives! Begin the year with a dynamic conversation with our own Assemblymember Nancy Skinner on the bigger picture of what happens in the state legislature! Hundreds of bills pass the legislature-but the media only covers a few! Find out about important legislation in the areas of environment, women’s issues, health, education, social services, and more that is under the radar screen of sound bytes! Please plan to arrive at 6pm so you can order your dinner before the program begins. This event takes place from 6:30-8:00pm at Buttercup Grill, 229 Broadway at 3rd Street. The event is sponsored by the National Women’s Political Caucus. The hot item for Tuesday’s meeting will be the votes on the implementation and funding of instant runoff voting, which I’ll be writing about in more detail tomorrow. The Council will also discuss providing a loan to the Fox Theater so it can pay its contractors, registration of foreclosed and vacant residential properties, the citywide parking policy study, and more. See the full meeting agenda and check out my post about how to watch and understand City Council meetings if you need some guidance on how or where to view the meeting. The non-ceremonial parts of the meeting start at 7pm in the Council Chambers in City Hall, 1 Frank Ogawa Plaza. Every month, the Central Committee meets to discuss party business and to make plans for the future of the Democratic Party in Alameda County. This month, George Lakoff will present on the ballot initiative he’s circulating that if passed would make tax and budget votes in the state legislature subject to majority votes, instead of 2/3 votes, which has allowed Republican legislators to hold the budget process hostage. If you’re interested in getting involved with the Democratic Party, this is a great way to do so. The meeting will be held from 7-9pm in the San Leandro Main Library, Dave Karp Room, 300 Estudillo Ave., San Leandro, CA 94577. Come be a part of Actual Rising, the grand opening party of Actual Cafe, which is a new cafe that’s very bike-centric. There will be music, beer, wine, and art by Allan Ayres. The party will be held from 6pm – 10pm at Actual Cafe, 6334 San Pablo Avenue (@ Alcatraz Avenue). Find more info about the cafe at their website or read Our Oakland’s review. I really wish I wasn’t going to be in LA this weekend so I could go to this because it sounds delicious. 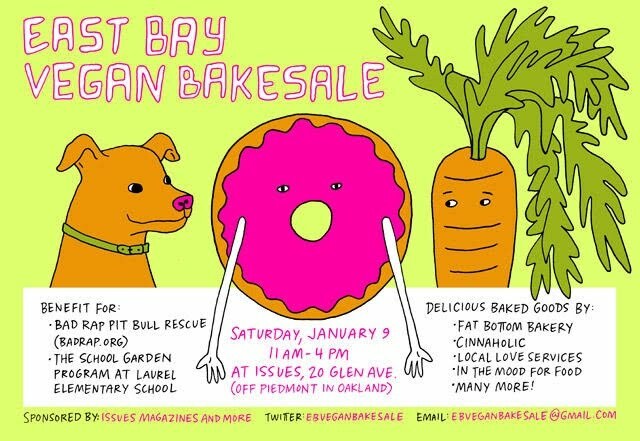 Several local bakeries will be donating scrumptious vegan baked goods for this sale, which is a fundraiser for Bad Rap Pit Bull Rescue and the School Garden Program at Laurel Elementary School. The sale will be held from 11am-4pm at Issues, 20 Glen Avenue, near Piedmont Ave. Find more info at the Fat Bottom Bakery Blog. There are a couple of sticking points remaining at the PEC regarding lobbyist registration. The current law exempts attorneys, architects, and engineers from registering as lobbyists. This is completely ridiculous. The way the law reads, they can meet privately with city officials if the attorney or architect has appeared at a public meeting or submitted documents related to ANY governmental action. I think people are supposed to assume this means they can only meet with city officials about permits or project approvals, but that is not what the exemptions says; it is much broader than this. Several of us are trying to get this exemption removed altogether. I mean, we had attorneys and engineers meeting with officials privately about the downtown zoning. Come on, people! Also, the lobbying law currently defines a “designated employee”, i.e., an employee that lobbyist must disclose contacts with, using a hugely long complicated legal definition in the Fair Political Practices Act. When you read it you don’t know what it is trying to say…argh! I mean, it is so ludicrous to use a definition that NOBODY will understand. I’m trying to get the PEC to adopt a specific list of positions, such as Fire Chief, City Clerk, department heads, boards and commissions, etc. Right now, the PEC doesn’t want a specific list. If they don’t adopt one, I’m sorry to say that people won’t know which employees are covered. This is a situation that lobbyist prefer, I think, because it allows them to exploit the ambiguity. They can then lobby all they want until somebody complains. If somebody does complain, the PEC would dismiss the complaint because under the current definition because it’s just too confusing and ambiguous. That is what the PEC did before with the definition of a lobbyist. The same situation exists for designated employees – the definition way to unclear. The PEC should take a principled stand and adopt a list of designated employees. (1) Is exempt from the state civil service system by virtue of subdivision (a), (c), (d), (e), (f), (g), or (m) of Section 4 of Article VII of the Constitution, unless the position is elective or solely secretarial, clerical, or manual. (2) Is elective, other than an elective state office. (3) Is designated in a Conflict of Interest Code because the position entails the making or participation in the making of decisions which may foreseeably have a material effect on any financial interest. (4) Is involved as a state employee at other than a clerical or ministerial level in the functions of negotiating or signing any contract awarded through competitive bidding, in making decisions in conjunction with the competitive bidding process, or in negotiating, signing, or making decisions on contracts executed pursuant to Section 10122 of the Public Contract Code. (b)(1) “Designated employee” does not include an elected state officer, any unsalaried member of any board or commission which serves a solely advisory function, any public official specified in Section 87200, and also does not include any unsalaried member of a nonregulatory committee, section, commission, or other such entity of the State Bar of California. (2) “Designated employee” does not include a federal officer or employee serving in an official federal capacity on a state or local government agency. The state or local government agency shall annually obtain, and maintain in its files for public inspection, a copy of any public financial disclosure report filed by the federal officer or employee pursuant to federal law. This is incomprehensible to the public and probably to most lobbyist and even for City employees. A simple list would be much better. Los Angeles, San Francisco, and San Diego all have lists – Oakland should, too.